If you’re not an NBA fan or follower of the Dallas Mavericks then you’ve recently missed out on a sports equivalent of Chernobyl as a vacation destination. The start of the NBA free agent signing period began on Monday and Dallas has quickly been informed that unless roofied or held at gun point, big time players don’t actually want to come play here. After some investigative research and chatting with some people on the inside, I was able to come across the transcripts of some recent phone calls made by Mavs GM, Donnie Nelson, to NBA players about their intentions of signing with the Mavericks. Mavs: Deron? You’re awesome, the best player available, and a Dallas native, interested in playing for the Mavs? Mavs: Dwight, you’re the best big man in the league and you obviously want out of Orlando. We’ll put up with your crazy, get you out of Orlando, pay you Gates-money and let you wear the cape; so, how about it? Superman: I’ll only sign with the Nets. Mavs: But Dwight, the Nets have nothing to trade for you, no money to pay you, and your GM says there’s no chance in Hades that he’d take back the trash heap they’re willing to give for you; we’d pay four guys to carry you around on a shoulder drawn chariot everywhere you go and flatten the entire city of Garland if that’s where you decided to put your estate. How about now? Mavs: I don’t think you understand Dwight, you have no leverage with your GM. I’ve chronicled my on-again/off-again relationship with reading books in this space before and 2011 has been another year of the same. When I find a book I enjoy, like others, I have a hard time putting it down. Conversely, I’ve hit on a couple of so-so items this year which cause me to first get bored and then struggle between thinking should I finish it or just decide that the TV is the much easier route to go. Once I get derailed, it takes a bit for me to want to get back into the habit and start the whole process again. In the last couple of months I have attempted to go a different route than the standard hardcover editions and given a try to reading some stuff on the old digital tablet. I’ve now made it through a couple of books in the Kindle app and am halfway through my second in iBooks. My goal here is not to debate the merits of either platform (I think I prefer the Kindle app at this point) but to quickly point out a new frustration I have with a medium that is still struggling to find its place in this world. When I was in college, my roommates and I lived and worked at the same place. The rent was cheap and the place was a bachelor’s dream. Four of us occupied about one-fourth of the square-footage above a print shop but still had plenty of space to stretch out. Our carpet was a mix & match of random samples, our shower was tetanus shot waiting to happen and we had no real AC in an area of the county that you definitely shouldn’t be without. We loved it. Our landlord/boss was a small business owner who somehow came into the printing world from Big 6 accounting. His learning curve was definitely trial-by-fire but I admired him for his desire to make it work. He was there every day and save for a few flare-ups of his micro-managing style, I really felt like he had what it took to make the business succeed. Knowing this, I was shockingly amused every time he’d remind us of the one simple rule he had for us; the tenants living above his place of business. We were warned more times than I can count on one hand that if we ever happened to catch anything in the building on fire1 our only responsibility was to, “fight the firefighters.” It’s both an entertaining statement and an insightful look into what he valued. This all came back to me as I settled in to watch my favorite NFL team once again this evening. If it wasn’t clear before, it has been solidified tonight that it’s about time for the Dallas Cowboys to “fight the firefighters.” A team of much talent matters little if there’s no leadership or cohesiveness among them. Sadly, a firing of the head coach wouldn’t even come close to solving the problem this time. The owner – who many once believed cared about winning – has finally proven to me that his ego and desire for the spotlight matters far more. Not often do you hope for losses but from this point out, I’m rooting for 1-15. It’s about the only chance we have at seeing big changes. Anybody else ready to fight the firefighters? 1In three years, only once did we have a fire and thankfully it went without incident. At the top of the list of things I don’t get used to, I would place stopping fountains of blood coming from my son’s face and subsequent trips to the ER to stitch up the gashes. It isn’t a new feeling, I’ve been sick to my stomach like this before. While getting dinner ready for the kid and myself this evening, he took a spill climbing into his chair and we were off to the races again. I was able to get the bleeding to stop here at the house with some medical tape but knew the 1-inch or longer slice needed medical attention. With his mother (and the family nurse) at work, Cohen and I were left to figure it out ourselves. I don’t know how to even describe what his head will look like after this but it will be his third scar on his face before the age of two, by far the biggest and probably most noticeable. 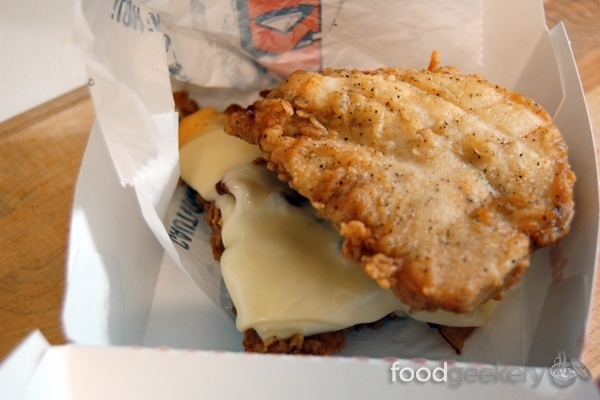 In a case of this may be a heart-attack-sans-bun, KFC looks to be doing some test marketing on their new Double Down Chicken Sandwich. I love chicken, and KFC has the ability to make a tasty fried bird, but this may be the least appetizing products I have seen come to market in a long time. I just hope this isn’t a push towards multiple items in the meat-as-a-bread category.